Posted on August 30, 2017 by Elina T.
I love this movie so much! I’ve probably seen it over ten times, and would gladly watch it again. Sometimes, I’m just not in the mood to watch something dark and intense and ominous. I know there are countless other movies out there that aren’t dark and intense and ominous, but Ocean’s Eleven is always my default. It’s just so funny and clever! It’s actually a remake of the original Ocean’s Eleven (with Frank Sinatra). But when they released the remake, it did really well, so they made two more movies (Ocean’s Twelve and Ocean’s Thirteen) which are equally as good and humorous. The movie starts out with Danny Ocean (played by George Clooney) who has just been released from prison (he was in for robbery). He immediately seeks out his friend, Rusty (played by Brad Pitt), and together, they begin formulating a plan to rob a a group of casinos in Las Vegas owned by a man named Terry Benedict. Although there are so many different characters (eleven on the team), I love all of their individual personalities and qualities. It’s actually really impressive that each character is developed so well as there are so many of them so props to the director! The plot of this movie is also really clever and well thought out. I love the twists and turns, and even though what they’re doing is pretty serious, the characters still seem to keep a light and humorous demeanor. This is definitely one of my favorite movies, and if you like funny heist movies, you should totally check it out! 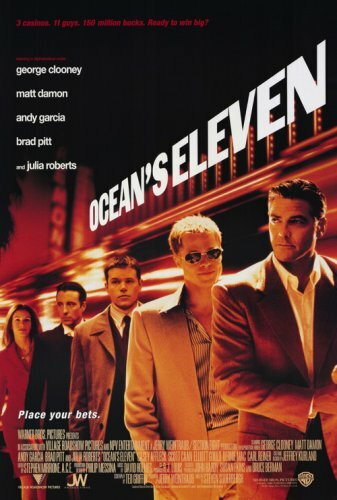 Oceans Eleven is available for checkout from the Mission Viejo Library. Posted on January 20, 2017 by Maya S.
In the dark, murky alleyways of the merchant town of Ketterdam, a story begins to unfold with a crazy team and a perilous heist. And, it all starts out in one of the biggest gangs, the Dregs. Kaz Brekker, a cripple and the head of the Barrel, the hangout of the Dregs, is back at it again. He receives an offer from Van Eck, a powerful merchant, describing a mission to kidnap a certain scientist. And, not being able to resist the pile of money, he starts to pick out his team. First, there is Inej, a young woman who has been traded in trafficking but whose freedom has been purchased. Now, she serves as The Wraith, a great climber and spy. And, though she is the right-hand (wo)man to Kaz, there may be other reasons she is joining the mission. Inej’s character reminds me of the song, “Selecter” from James Bond. The whole mood and rhythm of the song matches Inej’s outlook to each task she is given. Next, Jesper, is a trick-shooter who cannot seem resist a game of poker. His back story is slowly revealed as the heist unfurled. Then, Matthais and Nena, a pair with an unknown story, have to work together once again, even as memories emerge from their past. And, last, the newest member to join the gang, and the most cultured of them all, is Wylan. If this novel was turned into a film, a leitmotif for it could be Henry Mancini’s “Peter Gunn” for its strong espionage-like quality of music. Due to the heist, whenever situations get tense, this theme would pop into my head. Six of Crows was a crazy whirlwind of a book including an unforgettable heist. The novel was entirely riveting between the obstacles they overcame and how each character grew. I enthusiastically give a 9.8/10 to this Leigh Bardugo story. The only point deduction was the confusing introduction, which only proved to be a small bit useful later in the journey. Be sure to check out this novel as well as the recently published, Crooked Kingdom (second in the sequel), as well as the Grisha trilogy! 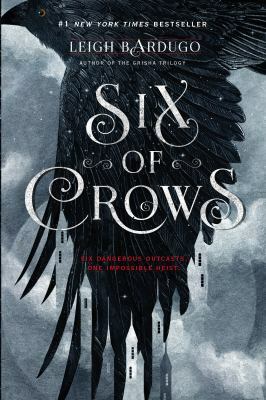 Six of Crows is available for checkout from the Mission Viejo Library. It can also be downloaded from Overdrive. Posted on January 13, 2017 by Max G.
I recently saw the film Rogue One, the latest film in the Star Wars franchise. I have to say, it was pretty amazing. The basic plot for the story takes place right before Episode IV A New Hope and follows the actions of the main character Jyn. Her dad, Galen was a well known engineer who was taken by the Empire to complete the Death Star. Galen hid Jyn away to save her from the Empire. Many years later the Rebel Alliance finds out who Jyn is and rescues her, as she was being held by the Empire for some small crimes. Their plan is to use her to gain the trust of her long time friend Saw Gerrera, who leads his own rebellion but it is much more chaotic and has been causing problems. 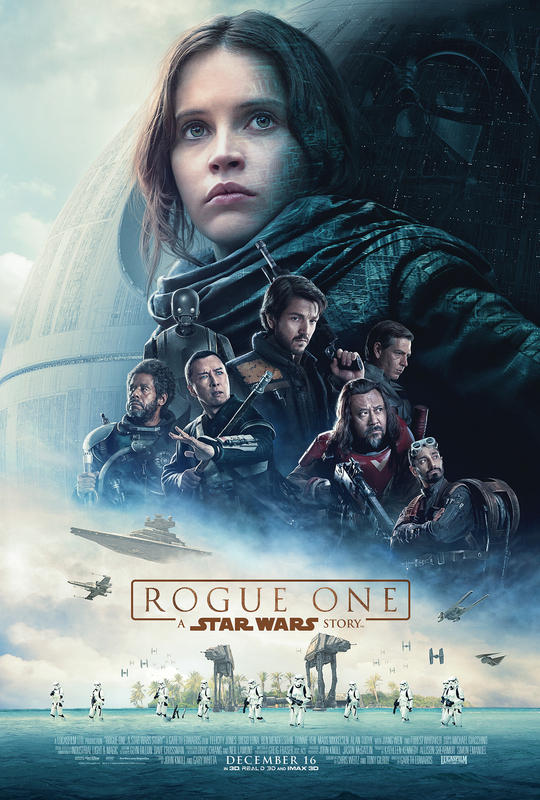 She gets there with the aid of a Rebel Intelligence agent named Cassian Andor, however the Empire decides to test out their newly constructed Death Star while the Rebels meet with Saw. Jyn and Cassian barely manage to get away, and receive a transmission from Jyn’s father (the main engineer on the Death Star) saying he hid a undetectable flaw in the space station as a chance for the Rebellion to destroy the evil weapon. They organize an attack on the archives that have the Death Star plans, which combined with the information Jyn’s father told them would be enough for the Rebellion to attempt the Death Star. This obviously leads into the plot of A New Hope, and it is done very well. I felt like you really got to bond with the characters, but unfortunately they had to kill them all off because none of them show up in A New Hope. It really explained how the Rebels did get the plans for the Death Star, and the sacrifices that it took to get there. This was a outstanding spin-off movie which definitely should set a standard for any other spin-off movies.